Vietnam a Country Not A War. As we say goodbye to Malaysia I can’t help but feel a pang at my heart strings. Angela and I have spent many a happy hour in the beautiful country of Sabah. 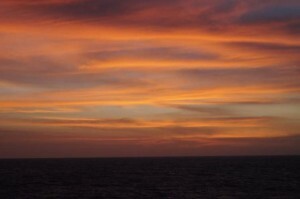 We hope to spend many more but as we sail away from the harbour in Kinabalu I do so with a heavy heart. However Vietnam beckons and as we have yet to visit this mysterious country we put our yearning for Sabah behind us and look forward to our next port of call. Vietnam has a history that weighs heavy. For many years the reports that came from this war racked country gave the Western onlooker the impression of a brutal land of slaughter and oppression. This was fuelled by the seemingly endless stream of Hollywood films that did nothing to dispel these myths. Now some forty years after the war the tourist visiting this land will find no bomb craters, no burnt out tanks, just a land of beautiful fields, magnificent temples and a wonderful people. It is a testament to the resilience of these people that the speed at which Vietnam has been able to turn itself around and place its past firmly behind it is truly astounding. With a population approaching 100million its sights are set firmly on the future whilst still of course never forgetting their past. In 1975 when North and South Vietnam reunified after almost two decade of bloodshed there followed another decade of hard-line Communist rule that only ended when economic sanctions were lifted by the West signalling a new dawn of prosperity for the beleaguered Vietnamese. It was the new beginning Vietnam needed. Tourists began to return at first at a trickle and then by an enormous flood. Visitors flocked to see the Northern city of Hanoi and the new Southern capital of Ho Chi Min City. Here they found more than enough to entertain them with the casinos and nightlife. Here western business is carried out next to the age old traditions. The looming office blocks overlook the roadside coffee houses and street sellers. Here the ancient and modern can be observed over a croissant and a coffee. The ever present tuc- tuc drivers do battle with the modern Japanese taxis to procure your business and the fruit seller competes with the sunglasses salesman to impart your much loved dollar from your grip. Officially the “Dong “ is the currency of Vietnam but with the exchange rate currently at 20.000 dongs to the dollar the street sellers tend to price everything in US currency. Oddly enough when you pay in dollars they give change in Dong. It’s a strange feeling to hold in your hand a million Dong and yet be little more than thirty pounds better off. As we approach Vietnam after a night at sea our first sight is of the Port of Nha Trang. Sitting below the lip of the Cai River, 260 Km north of Phan Thiet. It is now firmly established on the tourist trail. Its white beaches and ancient Po Nagar Towers that sit on the hillside above the Cai act as a draw to the myriads of backpackers and eco tourists that alight on their trip from Ho Chi Min city to the northern metropolis of Hanoi. The Aegean Odyssey slips silently into port at around noon and we make our way to the National Oceanographic Museum. Housed in a grand French-colonial building in the port district of Cau Da at the far south end of Nha Trang. 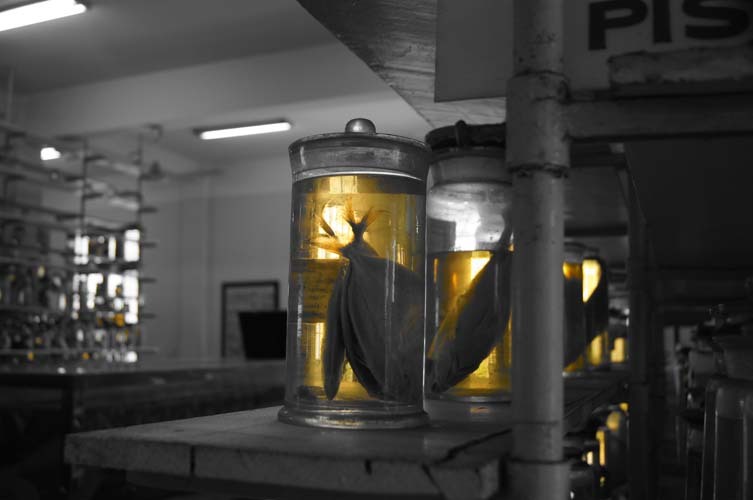 It’s attached to the Oceanographic Institute founded in 1923, and signs direct you around the tanks of live marine life and the 60,000 jars of pickled specimens. I admit to a passion for such exhibits and having spent many hours in the Natural History Museum of London I found this exhibit amazing. It gave me an opportunity to test my new camera (or rather Angela’s new camera) and to play around with its settings. The museum is situated within walking distance of the harbour and well laid out with neatly kept flower beds and a reasonable array of exhibits to keep the passing tourist engrossed. All too soon the visit is over and we set off to visit the Long Song Pagoda. This amazing building with its 152 winding steps to the top is a Buddhist temple is truly a wonder of Vietnam. Built in the 1930’s on the site of a previous pagoda, it now houses a magnificent 700kg Bronze Buddha sitting at the foot of the altar whilst capering dragons stand ready to protect their lord on the eaves of the roof. As we start to climb the staircase we are reminded that this is not for the faint hearted. The White Buddha carved in 1963 to symbolize the Buddhist struggle against the repressive Diem regime sits high above Nha Trang and gazes down on the city below. Lotus shaped carvings surround the statue each depicting an image of the monks that died in the struggle. Half way up the impressive climb we are met with the sight of the reclining Buddha. 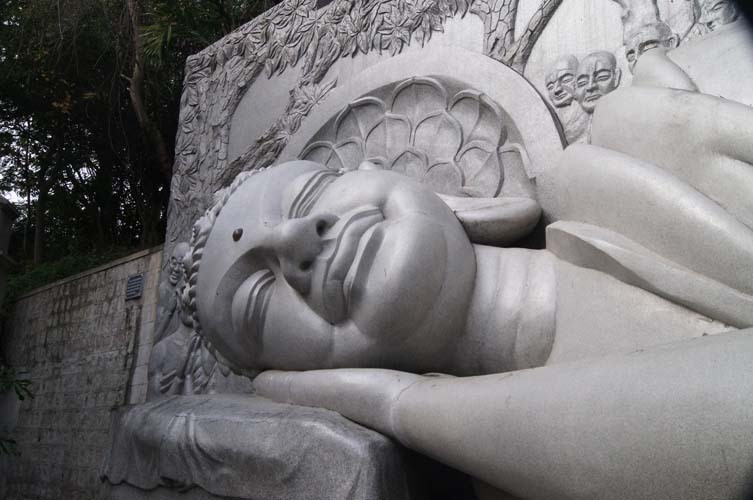 Built in 2003, this impressive reclining Buddha measures 14 m long and 5 m high. The Buddha is sound asleep and has a happy smile on his face. He is overlooked by carvings of 49 praying monks and devotees. As a naturalist I am of course always on the lookout for wildlife of any kind and in particular insects and spiders. On the way to the top we find a range of interesting specimens including a millipede and a beautiful moth clinging to the White Buddha’s plinth enjoying the warmth of the midday sun. Its markings were exquisite and despite its obvious presence I was amazed at how many people did not see it. It was quite literally hiding in plain sight. I stood before large black and white photograph. It was powerful image. A young Vietnamese child was lying in the arms of her mother. Her clothes hung from her in tatters and she was hideously burnt by the effects of napalm. Ironically her face was untouched, tears rolled down her smooth cheeks. She was beautiful. Next to me stood an old man. He too stared at the picture. The room was crowded although it seemed empty. Crowds of small children filed past, two by two, all dressed in neat blue pinafore dresses or shorts, all smiling and chattering frantically in Vietnamese. I wondered as to what such small children could glean form this place. Most of them held the latest phone in one hand and the hand of the child by their side with the other. Tourists wandered aimlessly from picture to picture occasionally making audible gasps as they came across an even more disturbing photograph. But still the room seemed empty to me. I turned to the old man. He was visibly shaking. The two sticks that supported him were gripped firmly by his withered hands. His knuckles were white with pressure. “Are you Ok” I asked. He continued to stare at the picture. “Is this your first time in Vietnam?” I asked in an attempt to illicit a response. “No” he answered without moving. “I was here in 68” He turned and walked away. “You know son they might have forgiven us” he said pointing at the children with his stick “I doubt if God will see it that way”. I turned back to the picture and then moved away myself. The memory of the picture has faded from my mind the old man’s words will stay with me forever. If the weight of Vietnam’s history falls heavy upon its shoulders then surely that of Cambodia’s must squeeze its very breath. When I was child my grandfather had a saying, one of many I would add. “The bird that sings in the morning is often taken by the cat in in the evening”. 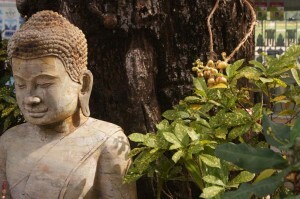 A saying I had no real understanding of at the time but when I visited Cambodia it became all too clear of its meaning. For the Cambodians are a beautiful people who despite their troubled past still manage to retain a unique insight into life. The Cambodians were as the proverbial bird, until one day in 1975 the “cat” appeared in the form of Pol Pot and the Khmer Rouge. The bird had sung its last chorus and the lives of so many simple Cambodians would inexorable change forever. How could something so beautiful, so simple, so proud be gone in the blink of an eye. It is true that the Cambodians like their neighbours the Vietnamese where no strangers to hardship and war but this was not the work of some foreign warlords hungry to secure power in east. No, this was the work of one of their own. The Barbary and savagery that followed over the next ten years was of the like that no one had witnessed since the foul stench of Nazism hung over Europe some 30 years earlier. By the time Pol Pot and his insidious regime were toppled in 1979 the broken bodies of nearly 3 million Cambodians lay in shallow graves. The Killing fields are a poignant reminder of this atrocity. 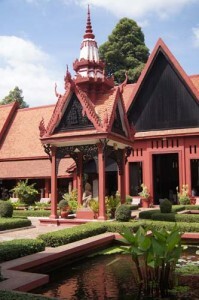 Pol Pot sought a return to the feudal medieval system of Cambodia’s predecessors. A return to the land, casting off the trappings of the 20th Century by eradicating all those that might pose a threat to his ideals. We could of course ask the questions as to why a West, so keen on the expansion of democracy stood back and watched as this brutal regime crushed its own people and wiped the blood from their hands as one would, the soft scales on the butterflies wings. There are those more qualified than I that will answer such questions. But one thing is certain the Cambodian people that sang in the morning were silenced as the evening sun set. We arrived in Cambodia at the port of Sihanoukiville, also known as Kampong Saom, very early in the morning. The early morning mist mingled with the hazy smog that hangs over South East Asia although Sihanoukiville has yet to be affected as much as some of the bigger cities we would see on out trip. It is a province of Cambodia on the Gulf of Thailand. This coastal city, a growing Cambodian urban centre, is located some 185 kilometres southwest of the Cambodian capital, Phnom Penh. The province is named after King Father Norodom Sihanouk and grew up around the construction of Sihanoukville Port. Work started on the buildings of the port in June 1955 and it was the only deep water port in Cambodia that allowed the ocean going ships to dock. The port was built in part due to the waning power of the French leading to the Vietnamese tightening their control over the Mekong Delta and hence restricting river access to Cambodia. Sihanoukville now attracts tourists with its relaxed atmosphere, white sandy beaches and numerous bars. However, the city has attracted not only tourists, but several NGOs and foreign and national investors in the last years in order to develop not only the growing tourist industry, but its capacity as an international sea port and other sectors like textile and real estate. Sihanoukville is also the location for the main factory of Angkor Beer, the Cambodian national drink. Today we would travel to Phnom Penh, the capital of Cambodia to visit such iconic sites as Wat Preah Keo Morokat otherwise known as the Silver Pagoda. Phnom Penh is a flat sprawling city that despite its neglected French Colonial-style facades and obvious stark poverty still lends has a romantic air. Cambodia is still one of the world’s poorest countries and one needs only to stroll around the crowded street markets or linger at one of the many food vendors to realise this. 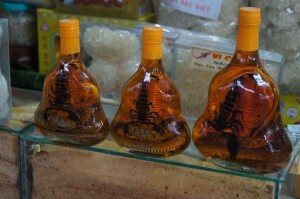 Scorpion and Cobra Wine: Cambodian Street Market. I admit to not being tempted to buy this . Both animals would be better suited to their life in the wild! The Vihear houses many national treasures such as gold and jeweled Buddha statues. Most notable is a small 17th century baccarat crystal Buddha known as the “Emerald Buddha” of Cambodia and a life-sized gold Maitreya Buddha decorated with 9584 diamonds, the largest of which weighs 25 carats. It was created in the palace workshops during 1906 and 1907; the gold Buddha weighs in at 90kg and is dressed in royal regalia commissioned by King Sisowath. 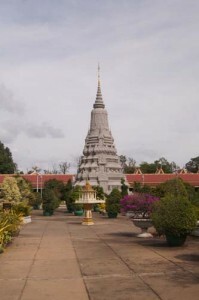 During King Norodom Sihanouk’s pre-Khmer Rouge reign, the Silver Pagoda was inlaid with more than 5,000 silver tiles and some of its outer facade was remodeled with Italian marble. Elaborate statues dedicated to the old rulers can be found throughout the extensive grounds and beautiful butterflies flutter from flower to flower whilst multicolored birds dart effortlessly between the pillars of the surrounding temples. It is truly and oasis of beauty and a place that should certainly be added to any itinerary when touring Cambodia. 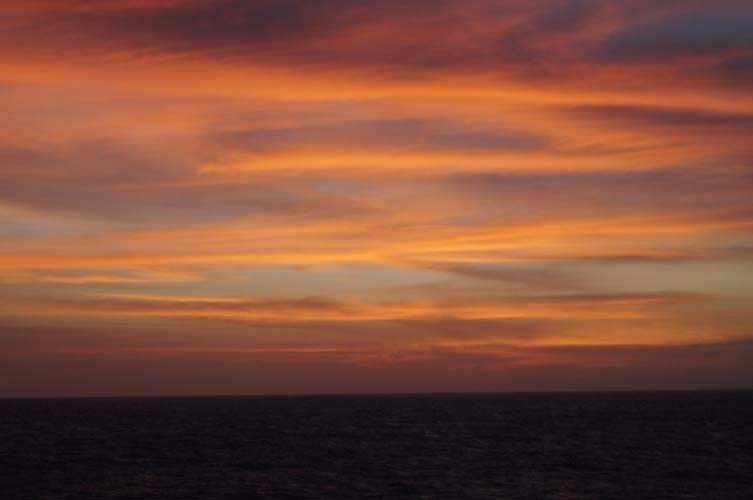 Returning to the ship we head out of the harbour and towards our final destination of Bangkok, Thailand leaving the coastal lights far behind us…..